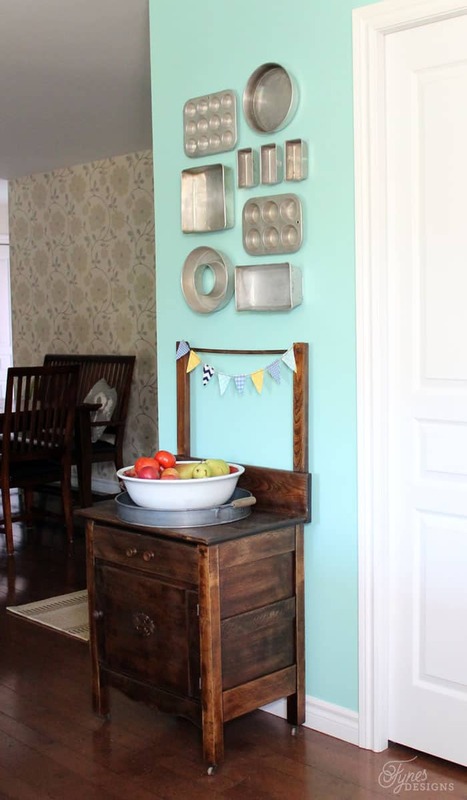 I’m so lucky I was asked to be a part of Kristen Duke’s Decorating with Family Pictures series. I love a good series or hop to give me the kick to get going on some back logged ideas. My daughters bedroom needs to have a few updates. It really needs painting and a new decor theme, but it has to stay on the back burner for a little while until I get a few other projects out of the way. An easy way to bring it up to date, and a little more age appropriate was to get rid of the baby frames and give her a mini photo gallery wall of her own, using some of our favourite family photos (she is still young enough to think her mom, dad, and little brother are pretty cool, I know it won’t last much longer). 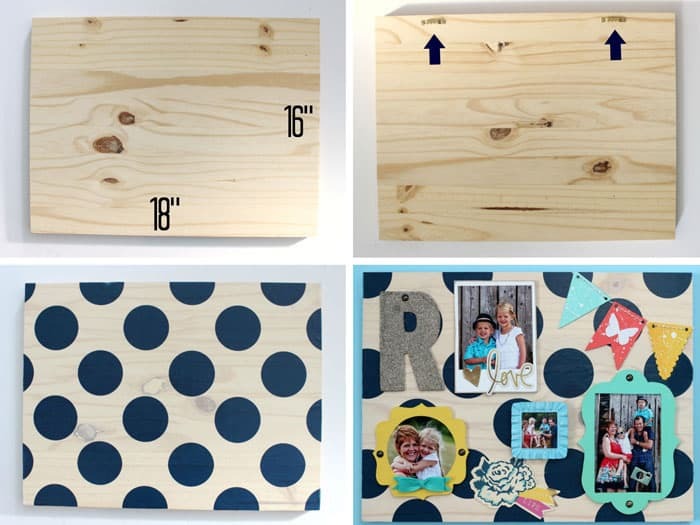 To create this easy project I purchased a 1×16 laminate pine board from the Home Depot. I had them cut two pieces 18″ long (the board was about $13 and I still have about half remaining for another project). Prepping the boards was super easy, I simply sanded the edge with a sanding block (the top was already smooth), and added two picture hangers to the back. Then I used new DIY Decor Tape from Hazel and Ruby to cover the board. (I’m totally in love with this huge washi tape, it comes in some really fun patterns!) This part literally took 3 seconds. I just rolled it out, stuck it to the board and trimmed around the edge with an exacto knife. 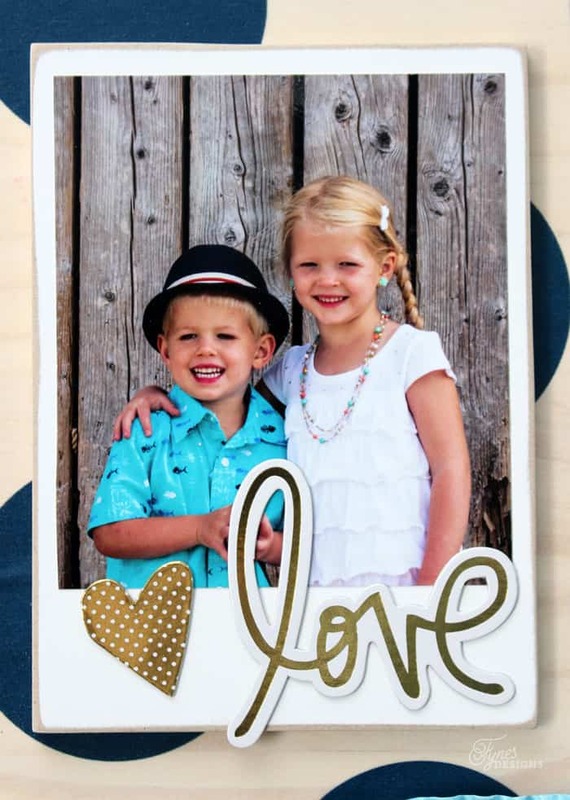 Instant pattern, and no fussing with paint! The roll is 12″ wide so I had to match up the dots for the second strip, still super easy. I LOVE that you can see the wood grain through the opaque parts. 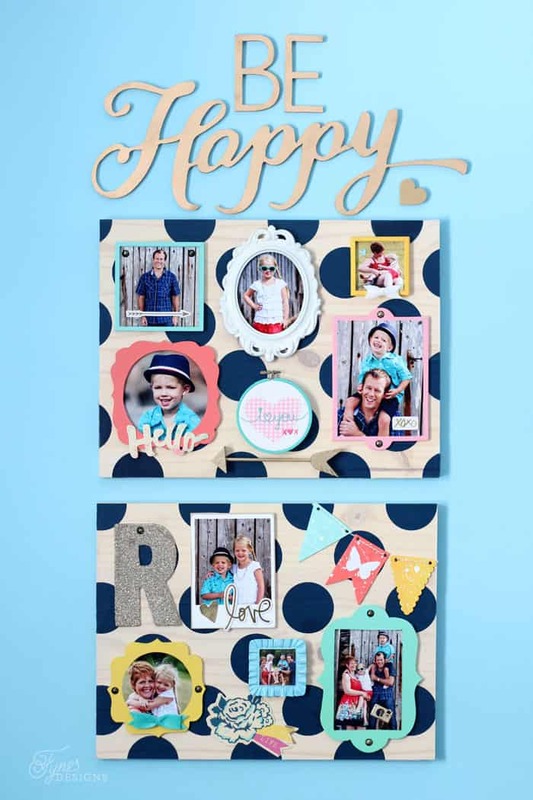 Because I have a snazzy new scroll saw I cut some of my little frames from hardboard (and my cute scripty Be Happy), but Michaels has tonnes of options of little frames to choose from if you recreate this project. 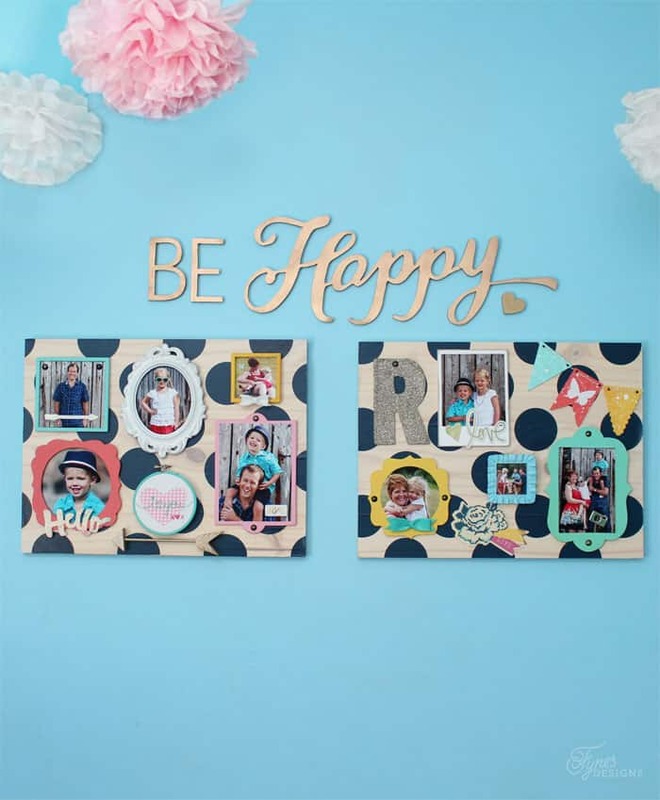 The two actual picture frames, the wood banner, felt bows and chunky glitter ‘R’ are also from the fun finds at Michaels. To embellish the frames I used a few scrapbooking wood veneers, and chipboard pieces from my stash. To hold the frames to the board I used upholstery tacks and 3M hanging strips. 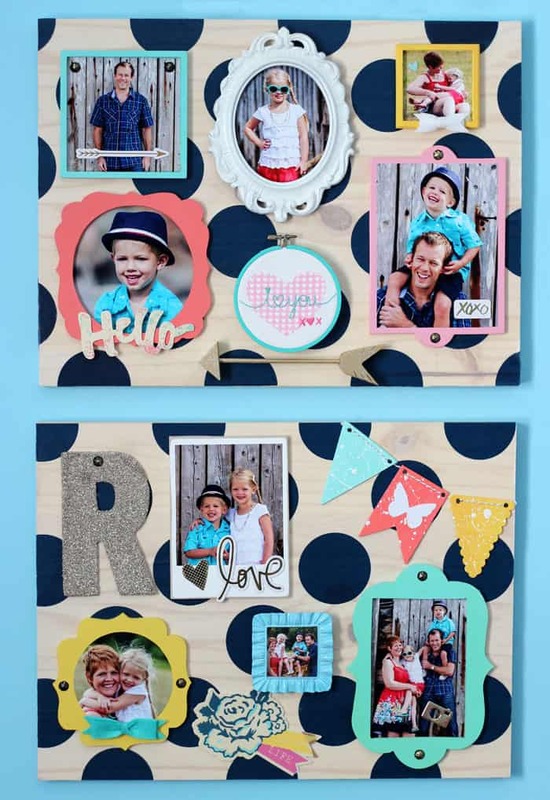 A simple alternative to frames is just a rectangle piece of wood painted white, to look like a polaroid, too easy! Adding in a few non photo elements adds a bit of interest to your photos. I tried hanging the mini photo gallery a few different ways, to see what worked. Which way do you think looks best? 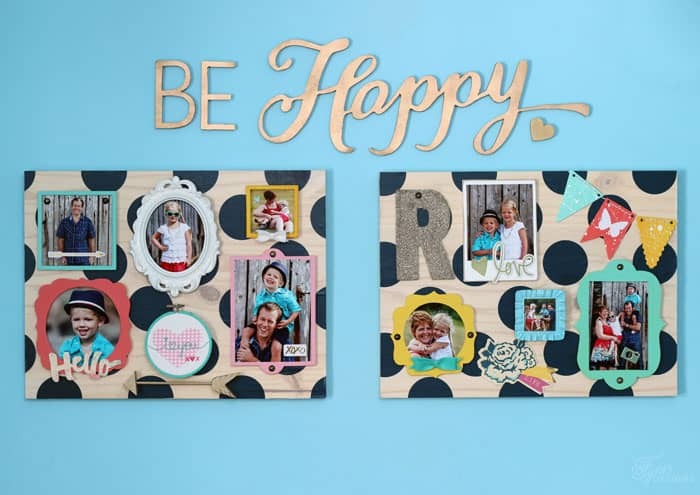 These mini photo gallery pieces of art, are much easier to conquer than an entire wall, I think having and 18″ limit makes it come together so quick. Plus you can get away with using 4×6 and 5×7 photos which is going to be much easier on the pocket book as oppose to large prints typically found in a gallery wall. 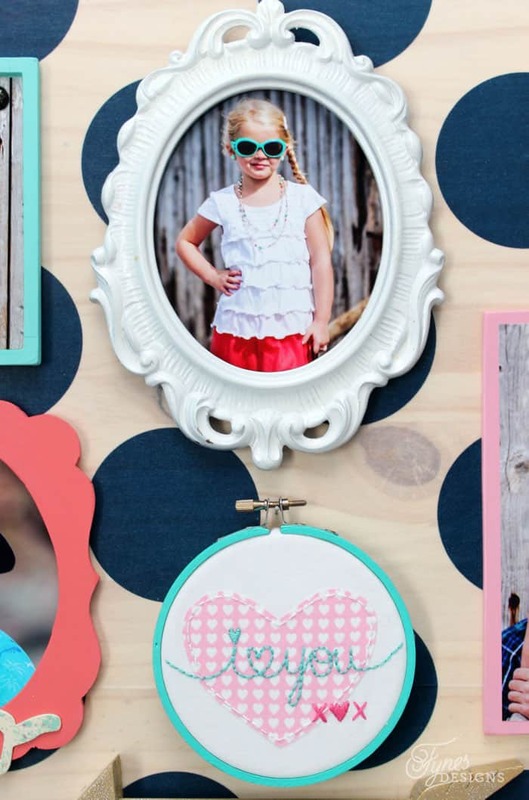 I hope this mini photo gallery idea gave you a spark for how get some of your treasure photos off the computer and on to the wall. 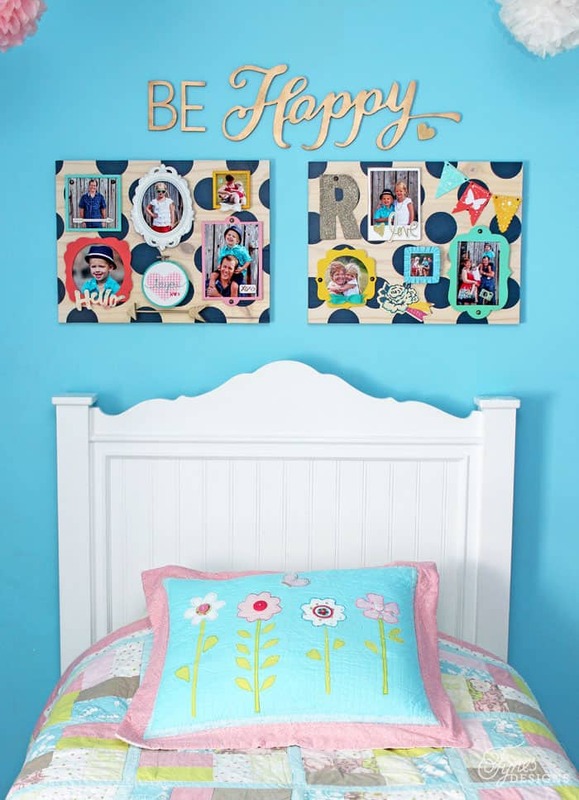 For lots of additional ideas check out the whole series on How To Decorate You Home With Treasured Family Photos at Capturing Joy with Kristen Duke. These are awesome. I think I like them side by side best.